Joshua Santospirito is an artist, writer and comic-maker based in Hobart, Tasmania and is most well known for his award-winning graphic novel adaptation of Craig San Roque’s The Long Weekend in Alice Springs (2013 San Kessto Publications). He also was the director of Her Majesty’s Favourite Really Great Graphical Festival from 2014-16: an illustrators and comics festival in Hobart. His work in graphic narratives is largely aimed at adult audiences and generally focuses on ideas around identity and culture in modern Australia. He is currently working on another collaboration with Craig San Roque named Sydney/Purgatorio ,which will take Josh many, many years. 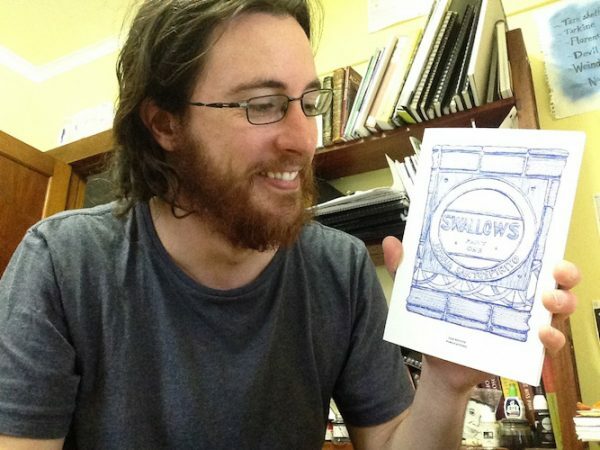 In 2015, his Swallows Part One was published by San Kessto Publications. 2016 – Radio National Art and Books review of Swallows.